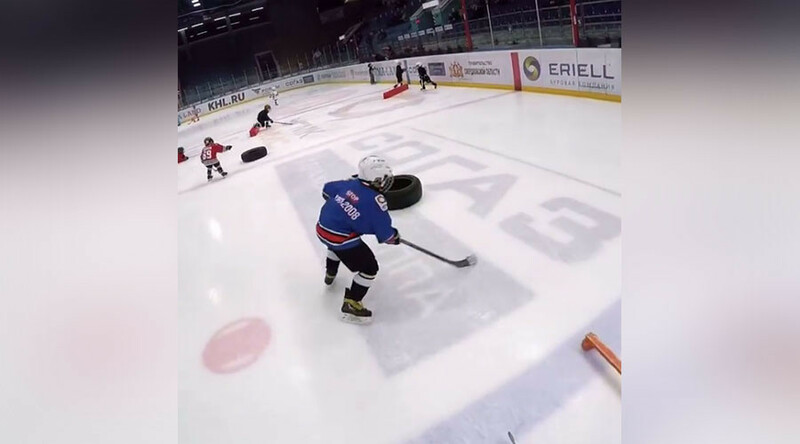 Russian ice hockey youth coach Alexander Antropov is known in his home city of Ekaterinburg for his passion for making short videos of kids performing elaborate drills during practice. Thanks to the success of the clips, he could be well on his way to wider fame. Antropov uploads his clips on his personal Instagram page, where they rarely get more than 50000 views. However, they go viral after others download and post the content on various social media platforms. One example which bears testimony to this, is a video which drew 59000 views on his Instagram page, but attracted over three million eyeballs when it was republished on a Facebook group called Minor Hockey Parents on December 10. Antropov is seemingly unfazed by his popularity. "It doesn't bother me much. If people like my videos, I don't mind that they post them on different pages," he told RT Sport. "I always liked watching all kinds of hockey highlight videos. And highlights of different kinds of sports as well. "I didn't see any original content of that kind coming from Russia though, so I thought that I should try to make my own,” he added. His latest video published on Instagram just four days ago has already been shared over 1500 times after it was re-plugged on a Facebook group. Rather than being carried away, the Antropov interprets the ‘likes’ and ‘shares’ as free publicity for his hockey school. "I know that my videos are getting millions of views on other resources, but I don't plan to block it in any way. "More people are learning about our school this way." Antropov is coaching a group of children born in 2008 for the Avtomobilist Hockey Club in Ekaterinburg, whose professional team is competing in the Kontinental Hockey League (KHL). Ekaterinburg is also home to legendary NHL star Pavel Datsyuk, who recently moved to the KHL to play for SKA St. Petersburg. When asked whether any of his students could reach such a level in the future, Antropov said that he and fellow coaches at the Avtomobilist will do all they can to help them in that endeavor. "Me and my colleagues we are training this group of kids from their first steps on the ice, we do what we can to help them improve their skills in this game. "But becoming a professional athlete is hard. Especially if we are talking about such high profile players as Pavel. But we will be happy if that happens one day."